Akhmad hoji Khorazmiy is an agronomist, ecologist and fiction writer. 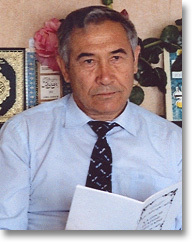 Born in 1948 in the village of Bagat in the Khorezm region of Uzbekistan, he graduated in Soil Science and Agrochemistry from the National University of Uzbekistan. He is a former professor at the universities of Urganch State and Tashkent. From his research into plant fertility and soil conditions in the 1980s and 1990s, he became convinced that the use of agrochemical fertilisers and sprays was ecologically damaging to the biosphere. His best-known work is the satire, Вакил [Vakil], roughly translated as ‘The Government Representative’, which became a sensation when published in 1999, but was quickly withdrawn from circulation. Other titles include: Илмга бахшида умр [Ilmga baxshida umr, ‘A life dedicated to science’], 2001; Кисмат [Kismat, ‘Fate’, literary essays], 2002; Хадиси шариф угитлари [Khadisi sharif ugitlari ‘The advice of Khadith’, essays on science and Sufism], 2007; and Хоразм хангомалари [Khorazm khangomalari, ‘The Khorezm Satire’, short stories], 2009. His numerous scientific monographs and textbooks include: Вопросы развития хлопководства Мозамбика [Voprosi razvitiya khlopkovodstva Mozambika; ‘Issues in developing cotton-growing in Mozambique’], 1991, which received a prize from the government of Mozambique; and Тупрокшунослик ва агрохимия курси [Tuprokshunoslik va agrokhimiya kursi, ‘Course in Soil-Science and Agrochemstry’], 1998. Since 2005, Akhmad hoji Khorazmiy has lived in England, where he continues his scientific and educational writing, as well as poetry and fiction. Having made his pilgrimage to Mecca in 1994, he is a Hadji; and he is respected as an Islamic and Koranic scholar and expert on Sufism, and as an advocate of Turkic culture. He is currently preparing a 10-volume edition of his Selected Essays.